The COLENTA ILP CTP processors concentrate on keeping the developer solution in the optimum condition and incorporate many mechanical and software features which ensure that the developer is correctly replenished and oxidation is controlled to the absolute minimum levels. In the case of replenishment, this is a fully automatic system which accurately calculates the area of plate entering the processor and injects fresh solution into the baths at the rates recommended by the plate manufacturer. Our replenishment programme will also replenish the baths accurately during periods when the processor remains on but is not being used (standby mode). There is also a Sleep mode feature which will calculates the required replenishment needed for the developer when the processor is totally inactive. Replenishment of the solution will activate automatically for a controlled period on start-up in the next working day. 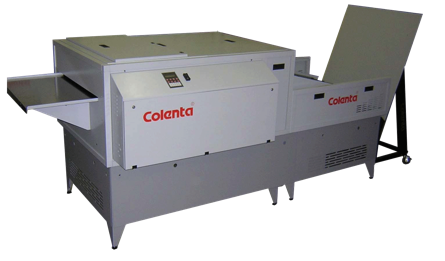 Colenta produce a comprehensive range of CtP Processing systems and support products for the processing requirements of Photopolymer, Silver and Thermal plates, fully endorsed by Agfa, Kodak and Fuji and available in both Offline and Online format to meet your precise requirements. Their robust design, build quality and low maintenance requirements make them an ideal choice for use in the press environments.